Students discover what stress is and how it impacts their emotions, body and health if it's not managed properly. Watch What is Stress? video with your students. 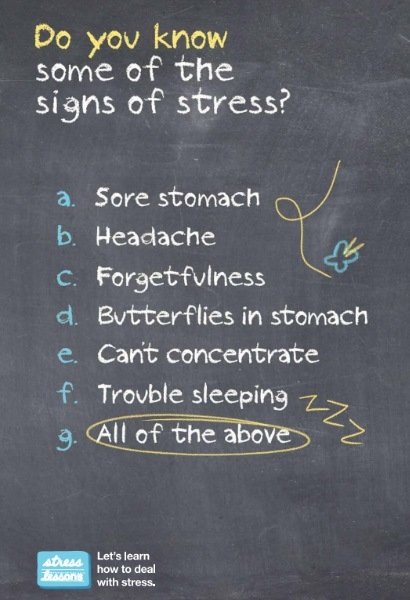 Lesson 2: Stressed or not Stressed? Students reflect on stressful situations and begin to think about ways they can cope. Lesson 4: Hooked on Stress! 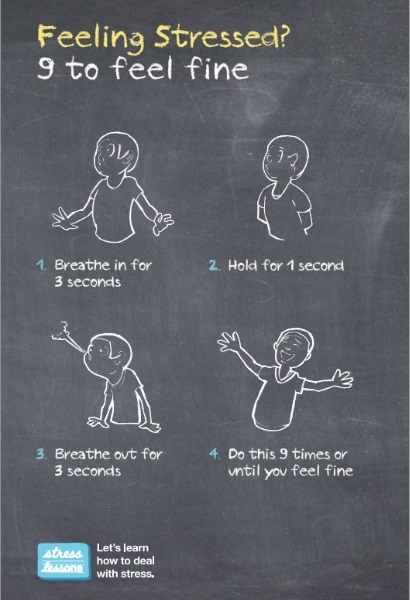 Students recognize that stressful situations can sometimes trigger negative responses and learn how to react to situations in a more positive way. Watch Hooked on Stress videos with your students. Students think about their worries and fears in a realistic and productive way so that they are equipped to manage situations that make them anxious or afraid. Students learn to break down problem into smaller ones so they can tackle them proactively. Lesson 7: What to Bust Stress? Express Yourself! Students review learnings from previous lessons in a fun way and explore creative self-expression as an effective stress buster.